Everyone has a different story as to why they started a particular collection. Mine was undoubtedly because my mother was an avid doll collector. I noticed her excitement over the years as she headed off to the local flea markets and doll shows in our area. She didn’t care if anyone wanted to look at her collection; it was purely for her personal enjoyment. If anyone wanted to admire her trove, then that was just an added bonus! She didn't collect Barbie dolls, although she did pick up a few of those along the way (which I now have!). But she did have many other lovely dolls. If I had to pick a timeline as to when I officially started my collection, it would probably be 1989, with the purchase of the number two “Happy Holidays Barbie”. Of course my original Barbie’s from when I was a kid were on display in my home long before the purchase of my first “collectors” Barbie. The initial Happy Holidays Barbie debuted in 1988 and is considered Mattel’s first official "collectible" Barbie. Once that collecting bug hit me, I was off and running with my new passion; Vintage Barbie’s! Many years later my collection has grown to include at least a sample of almost every doll available from the vintage years, along with many of the beautiful fashions and accessories! 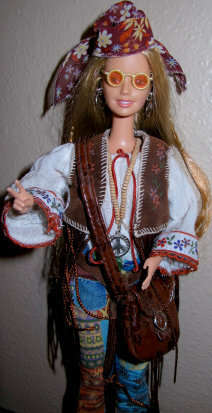 Of course I've added some new ones too, such as Holiday Barbie’s, the gorgeous Silkstone dolls and some fun dolls like the “Peace and Love 70's” doll (I had to have her since I was a teenager back then!). I've picked up porcelains, reproductions, and new collectors dolls over the years too. But the vintage dolls remain my passion. I’m hoping the next decade will bring me some prototypes, the harder to find dolls, and the more unusual ones, as well as a few more of the amazing Silkstones! I know my Barbie collection will never be complete. And I wouldn't want it to be, because half the fun of collecting is the hunt!